Conventional wisdom says that I should be paying off my student debt right now, working a stable job with good health insurance and settling into a lovely life. Better safe than sorry. Save for a rainy day. Find Mr. Right before your clock runs out (aka age 30, obviously). –Postpone grad school plans to spend 2 years as a Peace Corps volunteer in South America. …and yet, here I am, sitting in a South American hammock, eating fresh papaya, studying for the GRE and writing a lesson plan on irregular verbs. Conventionality is overrated. Can my passions make a difference in the world? Let’s start with the fact that there’s lots of debate right now about Millenials following their passion, and whether that’s practical or sustainable. Suffice it to say that I believe in purposeful and passionate productivity! 1. “What could I be passionate about?” I get excited about new ideas, research, sustainable development, international politics and community development. Like Gary Vaynerchuk puts it in Crush It!, there’s a niche for everything! What do you get excited about? 2. “What is the purpose?” or “How is that passion going to help make the world a better place and also keep me off of food stamps?” In my case, my passions combine into international affairs and development, two areas that have purpose and jobs. Luckily, these are areas that meet my skill set. 3. “How am I going to make my passion useful?” Whatever the passion is, you have a unique set of skills, talents, experiences and approaches to contribute effectively. I am working towards a career that contributes to sustainable development and policy, where my travel experience, extroverted personality and NPR addiction come in handy. What are your skills and talents? How can you make them useful to your passion? With these career goals in mind, I needed to figure out how I could get the experience and network to be successful in my career–who were the best organizations working in these areas? What were their projects? What skills did they look for in job applicants? What were the best graduate schools for this field? Who is making a difference in the world? I did what my generation does best: I Googled it. After a lot of research, prayer, brainstorming and resume-revising, I chose foreign affairs. I decided to apply for a policy internship at the State Department, the U.S. government’s foreign affairs branch, to get a feel for the big picture of diplomacy and development. It was a competitive and extensive application process, including six months for a security clearance and a move to DC. Finally, I was thrilled to land an internship in the Bureau of Populations, Refugees and Migration, where I spent four months seizing every opportunity to learn about diplomacy and foreign policy-making, pitch in on policy and budget projects, take notes on countless meetings and get coffee with as many directors, foreign service officers, policy planners and co-interns as I could! My State Department internship was a pivotal experience in my life: I left Foggy Bottom more certain than ever that I want to work in international affairs and development. 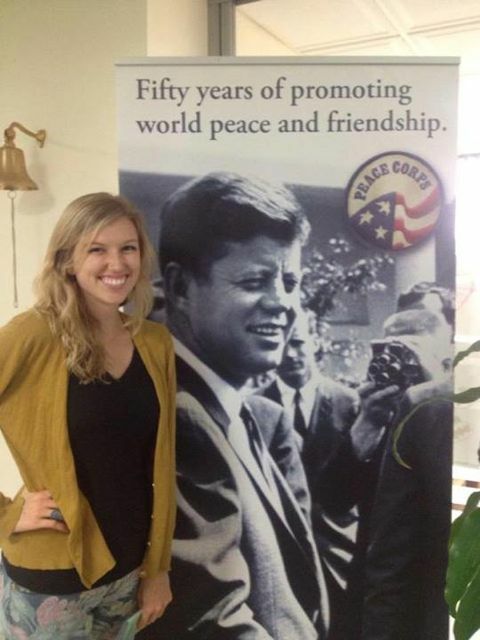 Shanna’s living one of her dreams: to serve in the Peace Corps, founded by President Kennedy in 1961 to promote world peace and friendship. Through my contacts at the State Department, I found a second internship, this one in fundraising & development at the U.S. Committee for Refugees and Immigration. There, I was able to cultivate a certain skill set in fundraising and data management while continuing to work with refugee policy. Working at an NGO headquarters was an eye opener. I got to see the differences in policies, budgets and priorities between the government and public sector. A natural next step was to apply to be a Peace Corps Volunteer: to serve at the grassroots level, gain international work experience and meet like-minded adventurers. On a personal level, I had always wanted to serve at a grassroots level, working directly with a community, and living abroad was a natural step. 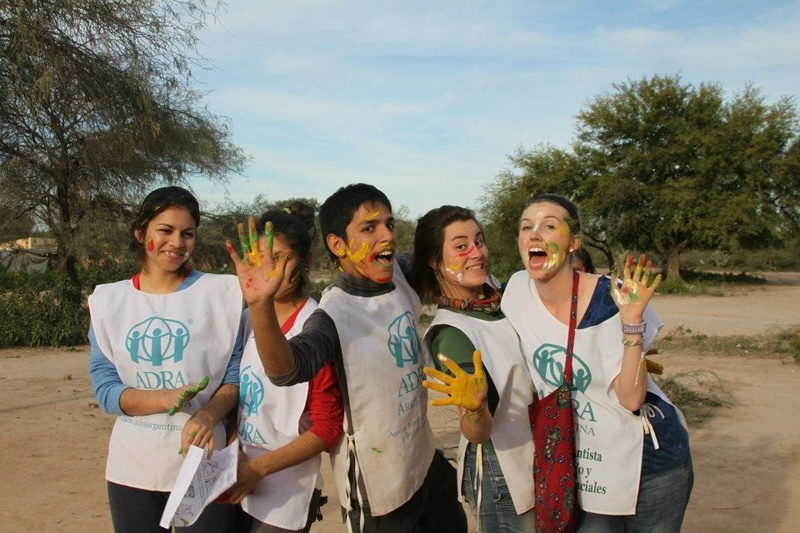 Professionally, the Peace Corps offered a chance to get two years of valuable international work experience, as well as membership in the “Peace Corps family,” a network of thousands of active professionals. The application process took about a year, which required a lot of patience and flexibility on my part. It’s a huge commitment, both because of the length of service and because of the conditions: the Peace Corps can send you anywhere, to do any job, anytime! The hardest part of the waiting game was the utter ambiguity of not knowing when or where they would send me. I spent the wait working extra hours at a gelato shop, wrapping up my internships in DC and practicing deep breathing. 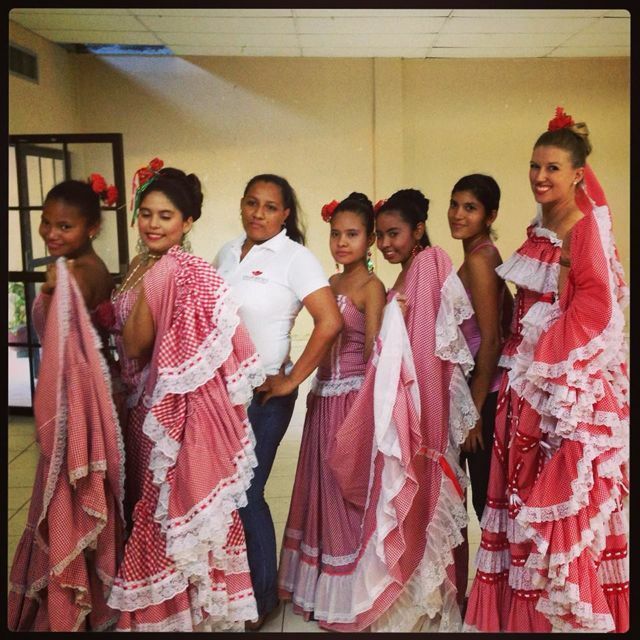 When I finally received my formal invitation–Colombia!–I did a Shakira-worthy happy dance on the spot and packed my bags for the Colombian coast. We arrived last August, receiving training in teaching methodology, pedagogy, curriculum development and other scintillating topics. Finally, we received our site assignments and began our work: teaching high school English and working in community development (and surviving on lentils, oatmeal and Colombian arepas). Though I’m just beginning my career, there are a few defining professional qualities and character traits that I’ve noticed. The bright, engaging, driven and successful people were also the most patient, curious, committed and flexible. These are qualities that I strive towards. 1. Patience/flexibility–I hate to include these mantras, but they’re what gets you through the applications, the waiting time, the long days and the bureaucracy! Not to mention that in the Peace Corps, it gets you through the long bus rides and training sessions. As for flexibility, being open to any tasks, new ideas and changes of plans shows your employers that you’re adaptable and committed to the work. 2. Committed self-starter/perseverance–You have to drive your passion; nobody else is going to do the work for you. Stay extra hours; add extra finishing touches; show your dedication. Don’t get discouraged by the waiting game, the job search or the paperwork. Remind yourself why you’re on this journey. 3. Networking–This is a crucial skill! Once I “got my foot in the door” at the State Department, I made professional connections and friends that form an international network of advisers, references and perhaps future colleagues! You don’t have to be a bubbly extrovert to be an effective networker; all it takes is a pocketful of conversation starters, a genuine interest in the other person and 90 seconds of courage to smile and shake their hand. 4. Say thank you and follow up–one of the best lessons my mother taught me was to always say thank you. Write a specific and gracious email; hand-write a thank you note; send a small gift. The important thing is that the person knows you appreciated their time and effort. This applies across the board, not just to new networking friends but also to colleagues and mentors. At the end of each job or internship, I made sure to hand-write cards with specific memories and things I appreciated, along with the person’s role in the experience. Following up with someone is even easier, but still essential. People are happy to hand out business cards, but often the connection is your responsibility. Make sure to be timely, grammatically correct and professional! It’s the little things that count, right? Equipped with a purpose, passion and the above lessons, I feel better prepared to continue the journey of contributing my passion and skills to making the world a little bit better in some way. Conventional wisdom might disagree, but I think you and I have resources, talents and knowledge to invest in our world. …And that brings me to my South American hammock. I’m five months into my two years of service and learning new lessons every day. After the Peace Corps, I don’t know what is next. It might be graduate school, teaching in Korea or going back to DC. But whatever it is, I promise you that it will involve a lot of traveling and passion and as little conventionality as possible! And another bowl of papaya. Shanna Crumley is currently living on the Caribbean coast of Colombia, where she spends her days brainstorming ways to make high school ESL more scintillating, learning to play tribal drums and testing the boundaries of her stomach’s tolerance to new and exciting foods. She is all about a life of adventure and service, which she blogs about over at www.pocketphilosophies.wordpress.com.